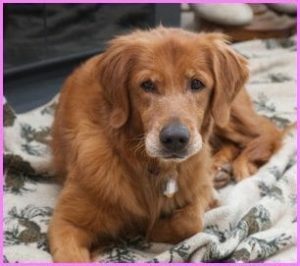 Angel #5154 and Sunset #5155 - Yankee Golden Retriever Rescue, Inc.
Angel was 11 and Sunset was 10½ when their owner was hospitalized and no longer able to care for her girls. A caretaker went out of her way to make sure Angel and Sunset were cared for until a placement for them could be found. This was especially important because Sunset was epileptic and needed her medication on a regular schedule. Once it was agreed that the dogs would come to YGRR, the caretaker even drove the dogs part of the considerable distance to meet our transportation volunteer. Angel and Sunset were given complete geriatric examinations upon arrival. 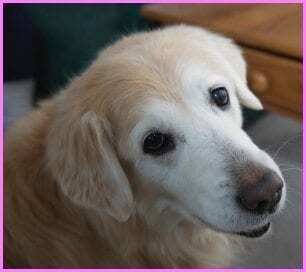 Sunset was a surprisingly active senior girl – she behaved more like a puppy than a senior! Angel was more laid back, though still frisky. Sunset had her dosage of medication adjusted based upon her bloodwork. She had a very large mass on her thigh that had to be removed, as well. Luckily this turned out to be benign. Our vet discovered that Angel had a mass on her liver that would need further follow-up. We brought both dogs back to Riverview and scheduled Angel to see a specialist. We could not know if the mass was benign or malignant without removing it, so Angel was scheduled for surgery. We were very concerned for her but knew she was in good hands with the surgeon. She came through her procedure very well, though she had to spend several days at the vet hospital to ensure there were no complications. 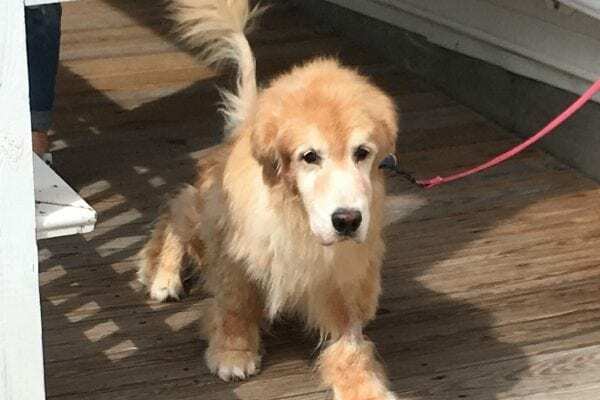 Then we got the news we were hoping for – Angel did not have cancer! Angel and Sunset now have the best home imaginable with wonderful repeat adopters. This family had previously adopted a bonded pair, Jake #4065 and Daisy #4064. They loved the experience and wanted to give another deserving pair the home they deserved. This wonderful family was committed to adopt Angel and Sunset no matter what Angel’s prognosis. They anxiously awaited the results along with our staff and volunteers, and they couldn’t wait to take them home after Angel had sufficiently recovered. Angel and Sunset have adjusted to their new life very smoothly. Their new family loves their different personalities. Angel is a snuggler and waits patiently for pats. She sleeps right next to the bed at night. Sunset insists on pats and chooses to sleep in bed with her humans. She is also learning that she doesn’t need to jump straight in the air when she wants attention! Angel is a “happy talker” when she is excited. Both girls love to go for walks, love to play in the snow and wrestle with each other, are excellent in the car, and enjoy carrot sticks for a snack. Their adopters adore their new additions and could not be happier to have Angel and Sunset join their family. As for our sweet and special girls, they love being the center of attention once again! Angel and Sunset thank you for your support. These senior girls both had medical issues that needed attention. We are able to take in special needs seniors and give them the care they need to have the best quality of life. This is only possible thanks to your contributions. Angel and Sunset thank you and send wags, kisses, and happy barks your way!